Smoking exacts a terrible toll in lives and health, and carries a severe economic price tag as well. Virginia's smoking prevalence has dropped since 2002 and is now on par with the national average, but much works lies ahead. Smoking can result in a number of health consequences, including cancer, cardiovascular disease and reproductive effects. Each year in the United States, approximately 440,000 persons die of a cigarette smoking-attributable illness, resulting in 5.6 million years of potential life lost, $75 billion in direct medical costs, and $82 billion in lost productivity. In 2005, Virginia's smoking prevalence was equivalent to the national average of 20.6 percent. This is down from 25.6 percent in 2002, but still well above Utah's 11.5 percent, the lowest rate in the nation. 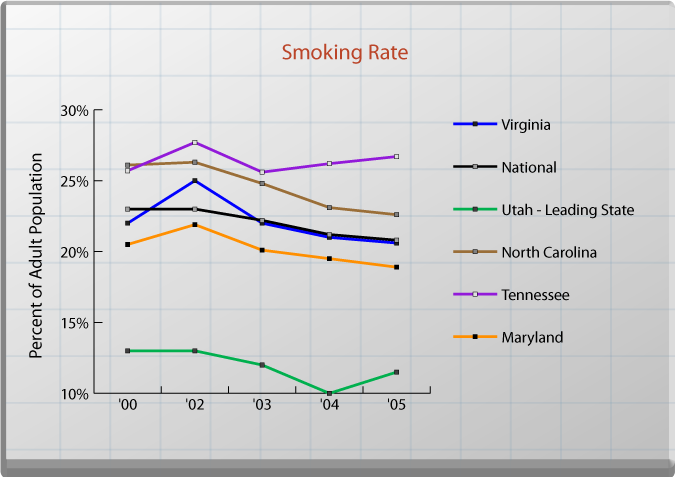 In 2003, Virginia tied with Wisconsin and Texas for the 23rd-lowest smoking rate in the nation. The percent of people smoking in Virginia in 2005 was lower than in North Carolina (22.6 percent) and Tennessee (26.7 percent), but higher than in Maryland (18.9 percent). The smoking rate tends to vary by age, education level and race. Smoking prevalence was highest among those aged 18-24 (23.6 percent) and 25-44 (23.8 percent) and lowest among those aged 65 and older (8.8 percent). By educational level, adults who had earned a General Educational Development (GED) diploma (39.6 percent) and those with a grade 9-11 education (34 percent) had the highest prevalence of smoking; those with master's, professional and doctoral degrees had the lowest prevalence (8 percent). Among racial and ethnic groups, smoking prevalence was highest among American Indians/Alaska Natives (33.4 percent) and lowest among Hispanics (15 percent) and Asians (11.3 percent). The state can influence smoking behaviors in a variety of ways: impose a tax on tobacco products and ban smoking in certain areas; create public education programs about the risks of tobacco use; support smoking cessation programs; and place restrictions on advertising aimed at youth. Tobacco Use Control Project (TUCP): The Virginia Department of Health's TUCP is a Centers for Disease Control grant-funded program that provides training, information, materials and other mechanisms to support the implementation of policies to help Virginians choose and maintain tobacco-free lifestyles. In its comprehensive approach to tobacco use control, the TUCP works closely with coalitions, health districts and partnering organizations to reduce youth tobacco use, increase cessation support, increase clean indoor air and eliminate tobacco use disparities in Virginia. Virginia Tobacco Settlement Foundation (VTSF): The VTSF was established in 1999, in part from funds from the Master Settlement Agreement, to lead efforts in tobacco use prevention among youth through education and awareness programs. For information and resources at the federal level, go to the Centers for Disease Control and Prevention, National Center for Chronic Disease Prevention and Health Promotion, Office on Smoking and Health (OSH): www.cdc.gov/tobacco/. OSH provides resources, including educational materials and research data, to health guide tobacco use control programs and efforts.